Backlog grooming has proved to be one of the most highly effective Scrum practices. It helps clarify backlog items and ensures that they are appropriate, ordered and ready for planning and development. Moreover, it helps enable effective sprint planning meetings. As teams become distributed and the nature of work changes, though, how can Scrum masters ensure that the process is transparent and convenient for all the team members, even if they work remotely? RealtimeBoard has some useful features we can use to facilitate transparent backlog grooming meetings. This use case is based on the article written by our client, Lieuwe van Brug, co-founder of Frontall.io and an experienced Agile coach, for a Realtimeboard guide to effective visual collaboration in Agile development. Backlog grooming is when the product owner and the rest of the team review items on the backlog to ensure it contains the appropriate items, that they are prioritized correctly and that the items at the top of the backlog are ready for planning and development. Why run backlog grooming meetings? Backlog grooming ensures that the backlog is healthy and helps the team to understand what to build for the user story. A healthy backlog includes the following characteristics. Each work item has an up-to-date estimate. Having a Definition of Ready means that stories must be immediately actionable. The Team must be able to determine what needs to be done and the amount of work required to complete the User Story or PBI. How to run a backlog grooming meeting with your team? splitting up user stories that are high priority but too big picture to fit in an upcoming iteration. 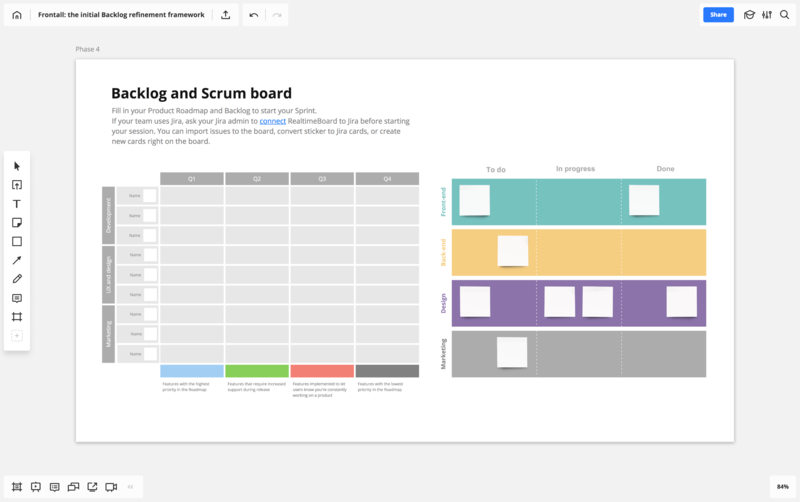 This is how you can do a backlog grooming meeting in Realtimeboard — an online whiteboard for seamless collaboration between Scrum masters and product teams. To start your backlog grooming meeting, create and name a board in Realtimeboard. 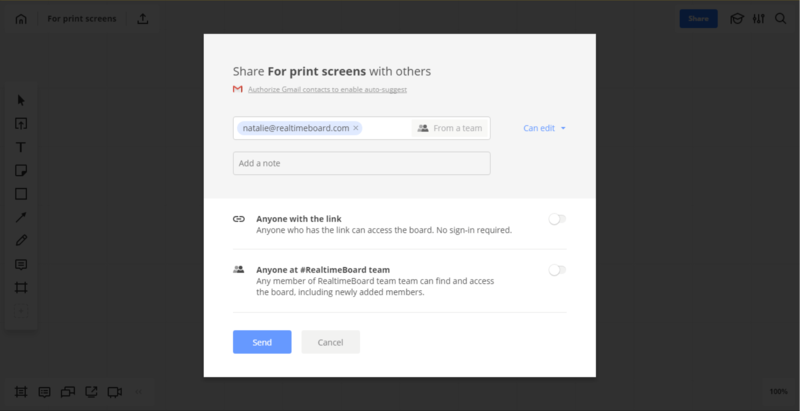 Invite your team members to the board by opening the “Share” settings. When they accept the invitation, every individual edit is viewable and saved. Ideation is usually discussed between business, product owners, architects, tech leads and, ideally, clients. This phase consists of gathering ideas, wishes or hunches. They always need refinement and customer validation. For idea generation, you can use different brainstorming methods and categorize the ideas in a convenient way; for example, you can use the “six thinking hats” of de Bono as a brainstorming method. 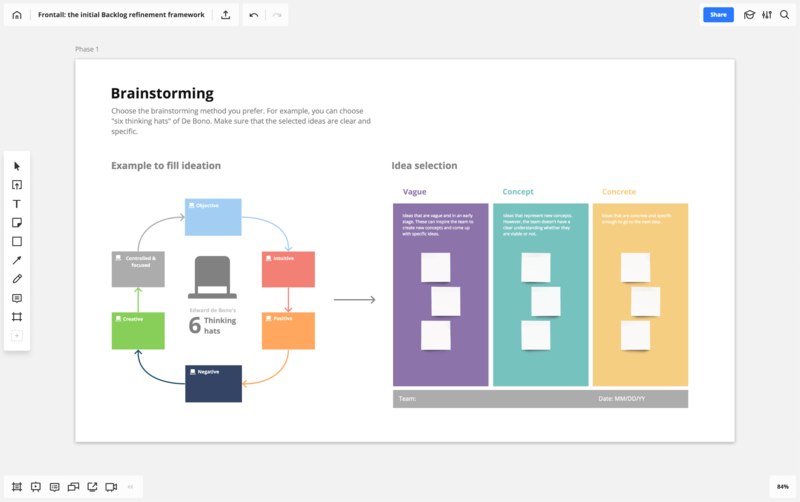 Start the ideation phase by using pre-made templates or creating your own in Realtimeboard. With an online whiteboard, even remote team members can actively participate by adding ideas, leaving comments and taking part in discussions. The next (optional) stage is validation. After ideation is done, the implementation of the idea is still full of assumptions. A discussion or workshop with real customers is a good idea to validate those assumptions. 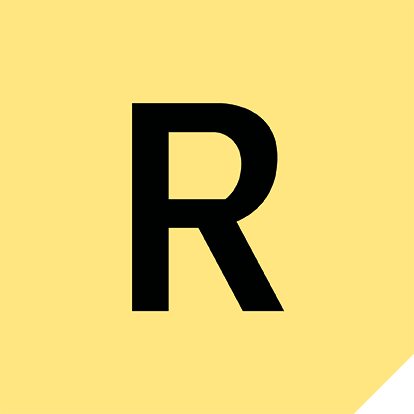 You can use Realtimeboard for this phase, as you can connect with users or customers remotely, share screens and discuss the scenarios freely. 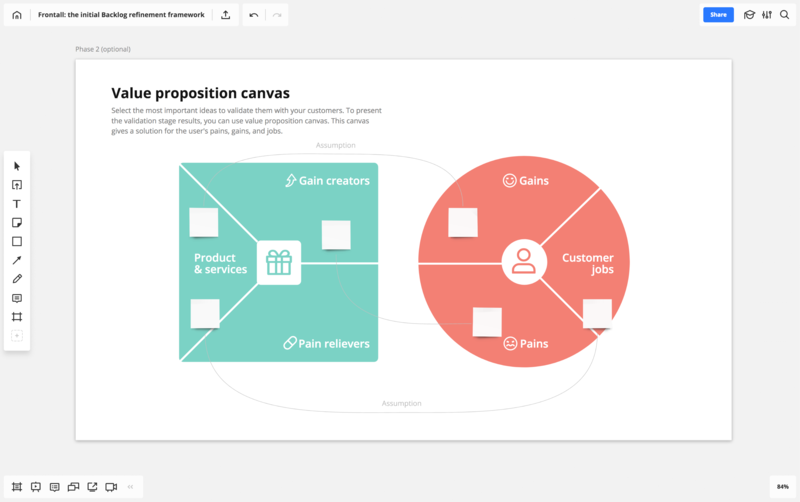 To present the results of the validation stage, you can use a value proposition canvas. This sets your solution against a visualization of the users’ pains, gains, and jobs. You can also estimate user stories via digital stickers and tags. The next step is to create a user story map based on the selected ideas. 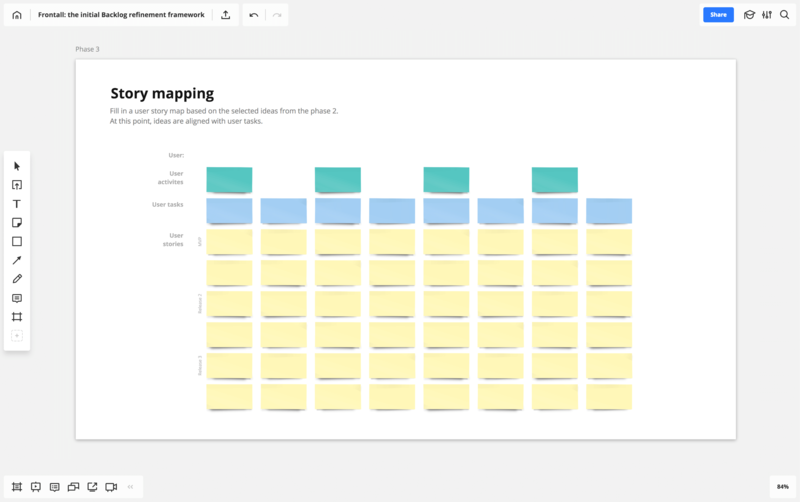 You can use the pre-made template from Realtimeboard or create your own. User story mapping is usually done by the product owner and Scrum team, when a rough idea is refined to user tasks. The idea moves towards real implementation at this point. Now your user story is ready to put in the backlog. If your team uses Jira, you can activate Jira integration in Realtimeboard and convert stickers with user stories to Jira cards right on the board. Depending on your needs, you can keep a backlog visible on the board or move it to Jira or another preferred tool. Now the backlog grooming is done, and you can start your sprint. Parallel with the sprint, you should start a new refinement process. If you did a previous backlog grooming session on a physical whiteboard using sticky notes, simply transfer the results to Realtimeboard. 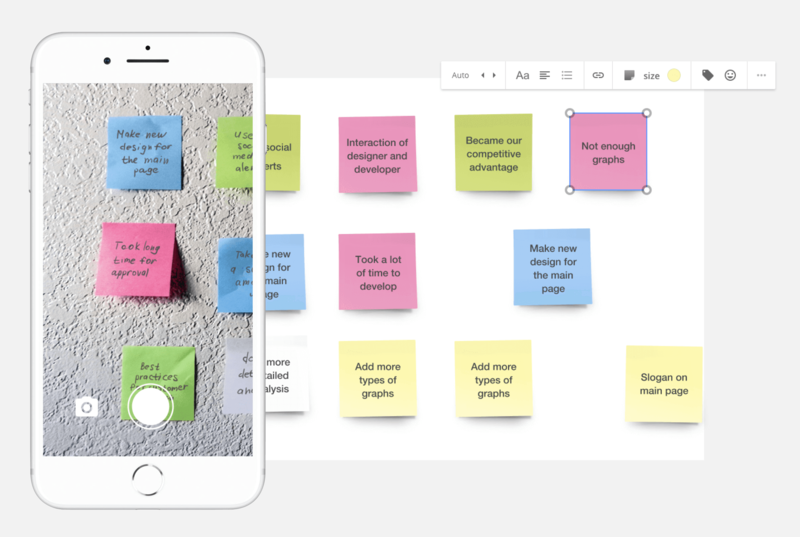 Open the Realtimeboard mobile app for iOS or Android and choose the “capture notes” feature to take a picture of the paper sticky notes, which will then be recognized as digital stickers on the online whiteboard. Doing all the phases on the board can help your team use visual aids during the whole process. User stories are too often documented in text format because of the user story mantra. Use visual collaboration and draw for your teammates more often to streamline this process and achieve outstanding results.